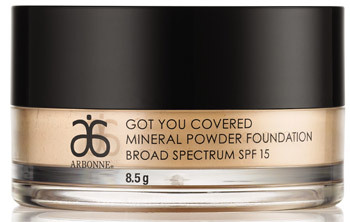 Perfect the natural 'no makeup" look with Arbonne's NEW Got You Covered Mineral Powder Foundation. With SPF 15, this silky-smooth mineral powder foundation is feather-light in its formula and works to conceal imperfections and provide buildable coverage for flawless-looking beautiful skin. This 'no makeup" feel formula is oil-, talc- and dye-free and helps prevent moisture loss to create a natural-looking, shine-free finish. Transform your complexion to perfection - we've got you covered! How To Use: With the Arbonne mineral powder brush, designed exclusively for this formula, press down onto the mesh sifter to pick up powder. Sweep over face in small circular motions until desired coverage is achieved. Gently tap jar to let unused powder sift back inside. Apply generously 15 minutes prior to sun exposure. Founded in Switzerland in 1975, Arbonne International, LLC, creates personal care and wellness products that are crafted with premium botanical ingredients and innovative scientific discovery. 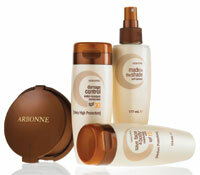 Arbonne products are vegan friendly, formulated without gluten, dermatologist tested and allergy tested safe. Arbonne. Pure, Safe, Beneficial. 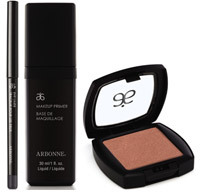 Thanks to Arbonne Australia here is your chance to win 1 x Bare-faced Beauty Makeup Set valued at $178.00.